Product #1265 | SKU TS24II | 0.0 (no ratings yet) Thanks for your rating! 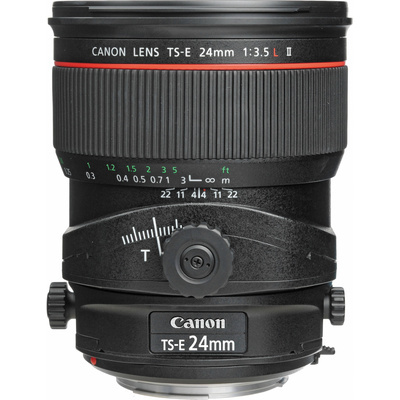 The TS-E 24mm f/3.5L II Tilt-Shift Lens from Canon is a wide-angle lens for EF mount cameras. It provides tilt-shift functions to control perspective and correct convergence of lines within your frame. It is especially useful in architecture, landscape, and product photography. The optical tilt mechanisms enable precise control of depth of field along with perspective control. The tilt-shift function on the 24mm f/3.5 lens allows adjustment of the focal plane by an angle of +/-8.5º and enables parallel shift of the optical axis by +/-12mm. Both tilt and shift can be engaged singly and in combination. The tilt-shift rotation mechanism locks at right angle and at parallel and clicks at 45º and the lens mount itself can rotate left or right by 90º with click-stop adjustment each 30º. Being a Canon L-series lens, its optical design and physical structure are optimal. Aspherical and ultra-low dispersion lens elements suppress aberrations and provide sharp delineation. Subwavelength Structure Coating (SWC) reduces ghosting and flare and truly circular diaphragm results in pleasing out-of-focus backgrounds. The focus ring on the lens provides precise manual focus action and the tilt and shift knobs are sturdy and control the mechanisms smoothly. TS-E lens is compatible with all Canon EOS cameras. Wide image circle of 67.2mm is 50% greater than 35mm/full frame film area. The tilt and shift mechanism rotates +/-90°, allowing shift in any direction and the tilt mechanism independently rotates +/-90°, allowing tilt in any direction relative to the shift. One Aspherical and three UD lens elements minimise chromatic aberration. Sub-wavelength structure and super-spectra coatings minimise ghosting and flare.